There's nothing straight about this movie. But here's the dope anyway: Cheech and Chong make their film debut in this riotous rock 'n' roll comedy, bringing with them the same madness, lifestyles and sketches that sold over 10 million records in the early '70s. Cheech and Chong's marijuana-laced humor keeps their spirits high and leads them to an outrageous finale in L.A.'s Roxy Theatre, where Cheech performs in a pink tutu and Chong dresses as a large red quaalude. It will make you feel very funny. Cheech and Chong represent arguably the definitive Seventies comedy act. Does their material still entertain 30 years after the fact? Via a viewing of their most famous film – 1978’s Up in Smoke - I figured I’d try to figure that out for myself. 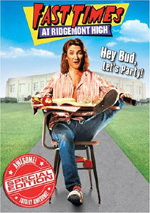 Marin plays an East LA Mexican named Pedro De Pacas, while Chong is a directionless rich kid named Anthony “Man” Stoner. When Man’s car breaks down on the highway, Pedro picks him up and gives him a life. They get high and become pals. 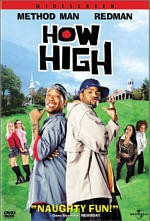 The rest of the flick follows their adventures as they seek more dope and also stay ahead of Sgt. Stedenko (Stacy Keach), a cop who works the drug beat. I’d never seen Smoke before I got this DVD, but that doesn’t mean it was my first exposure to a Cheech and Chong effort. I saw both 1980’s Cheech and Chong’s Next Movie and 1981’s Nice Dreams during their theatrical runs, and I also watched the latter on DVD a few years ago. I liked both back when I was a kid, but Dreams offered only sporadic pleasures a couple of decades later. At least it presented occasional amusement, though, which is more than I can claim for the borderline nonsensical Smoke. Like the others, Smoke essentially avoids a real plot. It features a general framework that acts as little more than a vague skeleton around which it can develop of series of comedic episodes. Most movies make some attempts to develop these in a coherent manner, but not Smoke. It goes from bit to bit without more than the most incidental attempts at a storyline. Look at the courtroom scene. The cops arrest Man and Pedro, they go to trial, and… that’s it. They immediately end up back at Pedro’s with no explanation for how they got out of their predicament. Those kinds of nonsensical bits abound in Smoke. Events happen for no reason other than their comedic value. Yeah, when Stedenko enters the flick, it tries harder to convey a real story, but not to a tremendous degree. The film continues to favor random comic events and pays little attention to any coherence. Perhaps if Smoke amused more often, I’d be able to forgive its lack of story or character development. Unfortunately, only a smattering of laughs crop up during its 85 minutes. To my surprise, the Stedenko moments provide the most amusement. I disliked Keach’s parts of Nice Dreams, but his cop routine here gets in some good moments. The rest of the time we find very little real humor. I think C&C are talented, but the movie doesn’t show off their skills. Smoke depends on drug references and wacky characters to generate its humor, but neither satisfies here. At least the movie does feature more uses of the word “man” than any other film in history. Otherwise I can find little to like about Smoke. It’s a dated and not very funny piece of work. 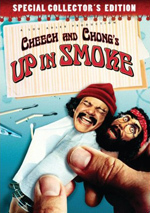 Up in Smoke appears in an aspect ratio of approximately 2.35:1 on this single-sided, double-layered DVD; the image has been enhanced for 16X9 televisions. As a low-budget comedy from 1978, I thought Smoke would look decent at best. I thought wrong, as the flick presented shockingly good visuals. Colors were a real highlight. Instead of the flat, understated tones I anticipated, the flick boasted lively, dynamic tones. The hues looked great throughout the movie. Blacks were also deep and tight, while shadows seemed fine. A few shots were a little dense, but most of them came across as clear and smooth. Sharpness also usually looked very good. A few wider shots seemed a little soft, and I noticed some minor edge haloes. However, most of the flick showed nice delineation and clarity. No issues with jagged edges or shimmering occurred, and I noticed almost no source flaws. A couple of specks cropped up along the way, but the movie was very clean overall. Though the minor flaws knocked my grade down to a “B+”, I felt very pleased with the picture quality. I encountered similar positives when I checked out the Dolby Digital 5.1 remix created for Up in Smoke. Audio quality was much better than expected. Speech could be a little stiff at times, but the lines were usually pretty natural, and they lacked any edginess or real problems. Effects played a small role, but they were clean and accurate. Music fared best. The various tunes showed fine range and definition, as they displayed great reproduction. I was really pleased by the high quality of the music. Though the soundfield didn’t excel, it was good for a cheap comedy like this. Again, music acted as the strongest part of the track. The songs showed very solid stereo imaging throughout the film. Effects didn’t have a lot to do, but they opened up the soundscape to a decent degree. A reasonable amount of material popped up on the sides to gives us a sense of place. Surround usage was minor, as the rear speakers did little more than reinforce the music and effects. Though this wasn’t a stunning soundtrack, I thought it sounded too good to give it a grade below a “B+”. In terms of extras, we begin with an audio commentary from director Lou Adler and writer/actor Cheech Marin. Both sit together for this running, screen-specific chat. The pair discuss various influences, the origins of some comedic routines, locations, cast and crew, music, editing, and general production notes. Like the movie itself, this commentary comes as a disappointment. Occasionally we learn a little about the flick, but don’t expect much depth or insight. Most of the time, Adler and Marin just giggle as they watch the movie. They simply don’t seem to have much to say about the film beyond very basic elements, and the track quickly becomes dull and tedious. Eight Deleted Scenes fill a total of 11 minutes, 27 seconds. These include “Pedro and Man” (1:52), “Red Birds” (2:43), “Leslie Horwinkle” (0:43), “Munchies” (2:39), “Momma’s Bedroom” (1:57), “Pop Stoner” (0:41), “Hippies and Valium” (0:09) and “Ajax Lady” (0:39). No additional plot threads emerge here, but since Smoke doesn’t really have a story anyway, that’s not a surprise. What does come as a surprise is that some of the bits are funny. “Leslie” casts Chong as a degenerate old man, and he gets in some good lines. “Munchies” provides a little more fun with Stedenko and his cohorts, though it loses some punch because it wasn’t finished; it refers to slides that we’re supposed to see, but instead we simply view blank screens. A few other decent gags emerge in the others. There’s nothing special here, but some of the footage is fun. We can view these with or without commentary from Adler and Marin. They give us a few basics about the scenes and why they were cut. Unfortunately, they don’t tell us a ton. There’s a lot of dead air and laughing at the scenes, so don’t expect many useful facts. You won’t miss much if you skip the commentary. Casting footnote: Harry Dean Stanton plays a cop who encounters Man and Pedro before they go into court. That gives the flick more of an Alien connection since Tom Skerritt plays Strawberry in the final flick. A featurette called Lighting It Up: A Look Back at Up in Smoke goes for 11 minutes and eight seconds. It presents remarks from Marin, Adler, and co-writer/actor Tommy Chong. We learn how C&C got together in the Sixties and the evolution of their career. From there we hear about some of their most famous routines, their move into movies, and some Smoke specifics. While “Up” is too short to be an in-depth look at Smoke, it proves pretty interesting. I’m definitely happy that we hear from Chong, as I’d worried he’d be MIA for the supplements. “Up” makes the most of its brief running time and gives us a good little piece. Next comes an Animated Music Video for “Earache My Eye” featuring Alice Bowie. It’s not traditional animation, as it takes the Terry Gilliam cut and paste approach instead. It’s an odd piece and not very interesting. Cheech and Chong’s “The Man Song” reinforces my assertion that the word “man” appears more here than anywhere else. It compiles most – all? – of the movie’s “mans” into one two-minute and 33-second clip. It’s strangely compelling. Some ads finish the set. We find two Vintage Radio Spots. One features “Horrendo Revolver”, which the other spotlights “Saydis Saydat”. Each one lasts about a minute and uses comedic characters to sell the movie. “Revolver” – a parody of Geraldo Rivera – isn’t very good, but “Saydat” has its moments. Finally, we get the movie’s Theatrical Trailer and a Preview for Blades of Glory. I guess Up in Smoke counts as a kind of comedy classic, but if you remove it from its particular era and scene, I don’t think it remains funny. Sure, the flick offers a smattering of decent laughs, but I don’t find enough amusement on display to make it worthwhile. The DVD presents surprisingly excellent picture and audio. Extras are more hit or miss – the commentary is a real disappointment – but they add some value to a very inexpensive set. If you like Smoke, this is a great little DVD. If you don’t, I can’t recommend this iffy movie.